Streetcars in New Orleans have been an integral part of the city’s public transportation network since the first half of the 19th century. The longest of New Orleans’ streetcar lines, the St. Charles Avenue Streetcar, which travels over 13 miles and is the oldest continuously operating street railway system in the world. 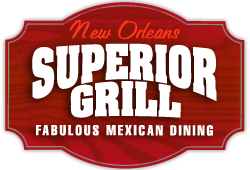 There’s no better way to see New Orleans than on the St. Charles Avenue Streetcar and Superior Grill is conveniently located just steps from Stop #21! The St. Charles Avenue Line starts uptown, at South Carrollton Avenue and South Claiborne Avenue. It runs on South Carrollton Avenue through the Carrollton neighborhood towards the Mississippi River, then near the river levee turns on to St. Charles Avenue. It proceeds past entrances to Audubon Park, Tulane University and Loyola University New Orleans, continues through Uptown New Orleans including the Garden District, and ends at Canal Street in the New Orleans Central Business District at the edge of the French Quarter, a distance of about seven and a half miles. The St. Charles Avenue Line has traditionally used streetcars of the type that were common all over the United States in the early parts of the 20th century. Most of the streetcars running on this line are Perley Thomas cars dating from the 1920s. The streetcar costs $1.25 each way. 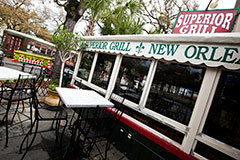 You may also purchase 1, 3 and 5 day VisiTour passes from the Regional Transit Authority for riding the streetcars and busses all around New Orleans. 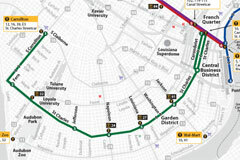 Download the Regional Transit Authority's PDF map and schedule for all of New Orleans' streetcar lines.